This FULL MOON you can no longer pretend. YOUR LIFE PURPOSE IS CALLING. ANSWER HER CALL. 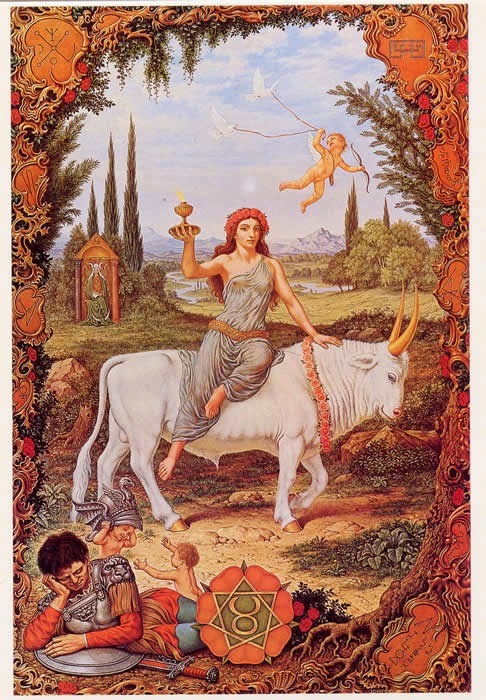 Today’s Full Moon in Taurus opposes the Sun in Scorpio, representing the height of the waxing lunar cycle. A Full Moon occurs when the Sun and Moon are exactly opposite each other by sign, representing the symbolic POLARITY that the opposing signs represent. ASTROSPEAK: The Sun is conjunct Venus retrograde in Scorpio, and the Moon is conjunct Uranus in Taurus. This polarity is square the lunar nodes at 01 deg 21’ Aquarius/Leo, creating a FIXED GRAND CROSS. TRANSLATION: We are at a crisis point in our awakening. What holds you back from your true life purpose? The energy of Venus retrograde in Scorpio gives us a clue as to where we are blocked—long term—and what lifelong issue keeps us from manifesting our true creative potential. What are the things we tell ourselves—long-term—that keep us STUCK? The ENERGY IS THERE—with Uranus in the mix—for a sudden AWAKENING. RITUAL: Tuesday night under the full moon. 1. Light a white candle for the moon. 2. Write down your heart’s desire and ask for it to come true for you. Put the paper under the candle. 3. Meditate: imagine your wish coming true: see it, feel it, and KNOW that you will learn the TRUTH about what you are wishing for, even if you don’t get it the way you think you want right now. Let the candle burn all the way down. 4. Put the paper under your pillow, asking that you get insight about your desire through your dreams. 5. When you feel you are ready to release the ritual, either bury the piece of paper or burn it, thanking the Universe for giving you insight into yourself and deeply feel the gratitude for whatever will happen. What is your soul asking you to do? If you have been feeling drawn to DO SOMETHING DIFFERENT. you may be hearing a call from your soul to “follow your bliss.” Are you going to listen? This Full Moon period can be extremely passionate and physical; the Taurus Moon opposing the Scorpio Sun may require balancing emotional possessiveness with true inner power. The Taurus/Scorpio polarity represents holding on versus letting go, and is a predominant theme over the next few days. The Full Moon period signifies the peak of the waxing Moon energy... a great time to focus on spiritual, magical energies in order to direct them through meditation or personal ritual. Many also focus once again on the goals that were set at the previous New Moon, and utilize the intensity of the Full Moon to release their intentions to the Universe with gratitude and respect. Be Careful how you handle your money around the FULL MOON, since your judgement may be clouded by an outmoded ideal. Focus instead on how you can make better use of your resources, and wait before making any major purchases. The Full Moon in your second house may find you more emotionally identified with your values than usual, or even strongly attached to possessions and material objects. Remember, it's not the object that's so important to you but the emotional content it represents. The second house also represents what you truly value, and you can now assess what is truly essential to who you are and what is not. FIFTH HOUSE : romance, arts, entertainment, creativity, children, investments, gambling, fun.